Die Zwergkanadagans wurde neu in die Club300 D-Liste aufgenommen. Für das Ranking zählbar ist allerdings nur Hutchins Zwergkanadagans Branta hutchinsii hutchinsii, da nur Vertreter dieser Unterart als Wildvögel in der Westpaläarktis zu erwarten sind. Aufgrund der Probleme bei der Bestimmung der Unterarten und der sicheren Unterscheidung von der kleinen Kanadagans-Unterart parvipes ergänzen wir die Aufstellung der einzelnen Formen hier mit einer Zusammenstellung von weiterführenden Links und Fotos. 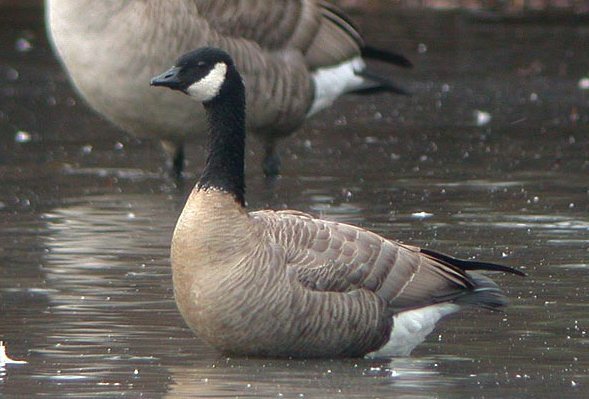 Anmerkung zum englischen Namen "Lesser Canada Goose": Während amerikanische Birder damit die kleine Unterart parvipes der Kanadagans Branta canadensis bezeichnen, benutzt die British Ornithologists' Union diesen Namen für die Zwergkanadagans B. hutchinsii, die wiederum bei der American Ornithologists' Union Cackling Goose heißt. Abb.1: Zwergkanadagans Branta hutchinsii hutchinsii zusammen mit Kanadagans B. canadensis canadensis, Long Island/New York, USA, 7. Januar 2005 (© Angus Wilson). Abb.2: Zwergkanadagans B. hutchinsii und Kandagans B. canadensis, Colorado, USA, November 2004 (© Bill Schmoker). Abb.3: Zwergkanadagans B. hutchinsii hutchinsii, Bantpolder/Lauwersmeer, Niederlande, März 1998 (© Roef Mulder), accepted by CDNA. Wiedergabe mit freundlicher Genehmigung von Roef Mulder aus www.lauwersmeer.com. c: Bantpolder/Lauwersmeer, Niederlande, Oktober 2005 (© Jan Bosch, www.birdpictures.eu). 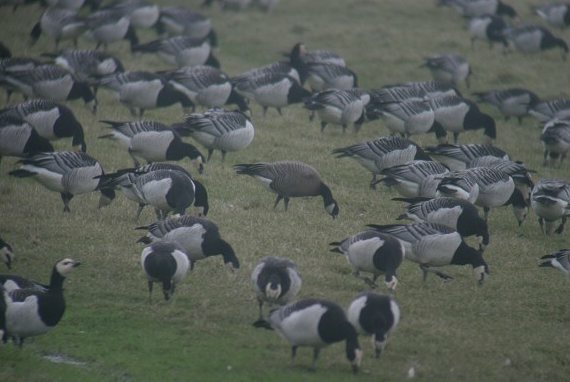 Anmerkung: "In the Netherlands, minima regularly occurs in large flocks of Barnacle Geese, but has not been added to the Dutch list because of its westerly range, and the fact that many of the birds have had captive-style rings. Wild banded birds may have yellow collars. Wild birds are reported to be relatively tame" (zit. aus: Angus Wilson, Link 2). Von der CDNA werden nur Tiere der Unterart hutchinsii als Wildvögel anerkannt. Abb.5: Zwergkanadagans B. hutchinsii (ssp. minima oder taverneri? ), Friesland, Niederlande, März 2006 (© David Hoekstra). Wiedergabe mit freundlicher Genehmigung von David Hoekstra aus www.lauwersmeer.com. Abb.6a-c: Zwergkanadagans B. hutchinsii oder Kandagans B. canadensis der Unterart parvipes, Massachusetts, USA, November 2004 (© Glen Tepke). Abb.7: Kanadagans B. canadensis, wahrscheinlich Unterart parvipes, Margrethekog, Dänemark, 21. März 2005 (© Knud Pedersen). Wiedergabe mit freundlicher Genehmigung von Knud Pedersen aus Netfugl. 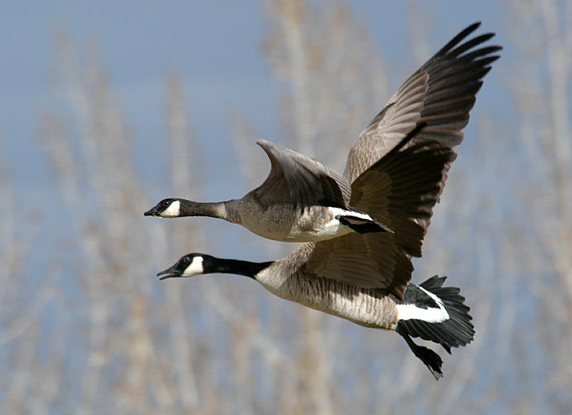 "The recent split of the Canada Goose complex presents a "new frontier" in identification for birders in Europe. There is still much to be learned about the ID of the different races and this should be kept in mind when reading my comments on the identity of the bird photographed by Knud Pedersen. 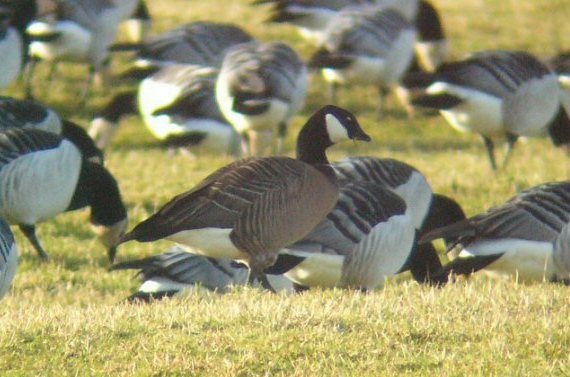 This bird was originally identified as Branta hutchinsii. 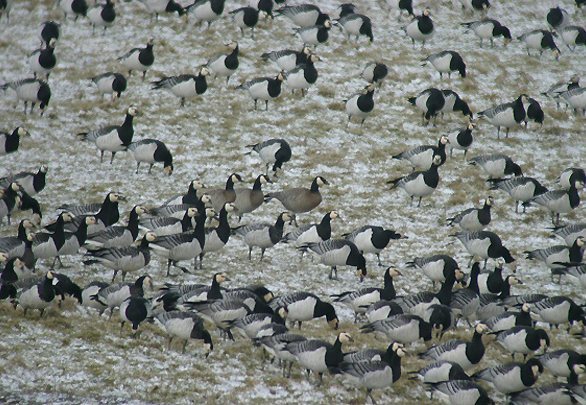 However several features indicate that the bird is belonging very likely to one of the smaller races of Branta canadensis, the race parvipes probably being the best bet! 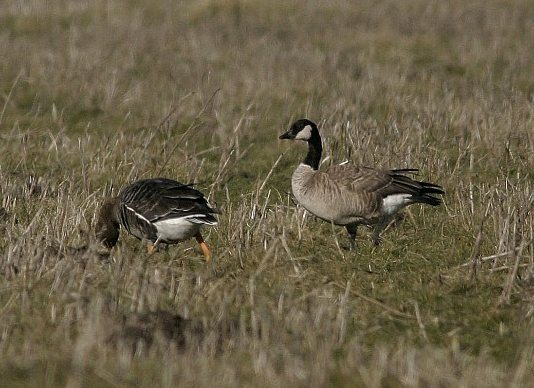 The bird seems quite small and although the size cannot be assessed with certainty, it seems that the bird is about the same size as (or perhaps somewhat smaller than) the accompanying Greater White-fronted Goose Anser albifrons. 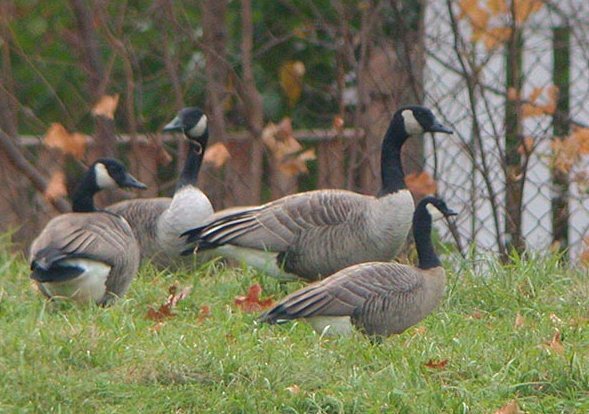 This indicates that the bird is either a small race of Branta canadensis or one of the larger races of Branta hutchinsii. The neck does not seem to be particularly short or thick (as it normally does in hutchinsii) and the bill is quite long and slender. The bill of Branta hutchinsii is normally very short (similar to Lesser White-fronted Goose Anser erythropus - although there is some variation). 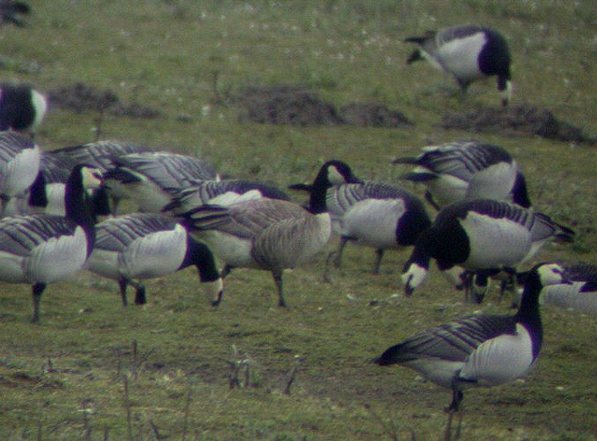 Branta hutchinsii normally shows a very steep forehead very similar to Lesser White-fronted. 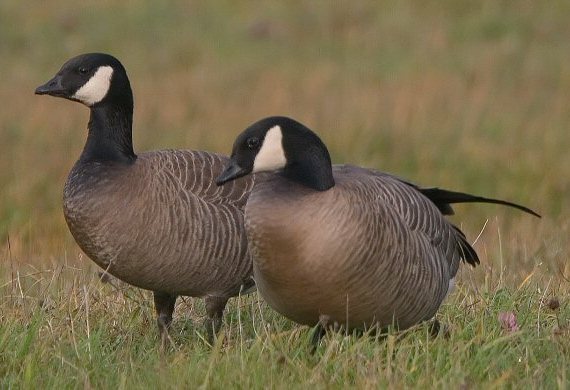 The bill length of Branta canadensis is normally 70-75% of the head length whereas the bill length of Branta hutchinsii is normally about 50 % of the head length. 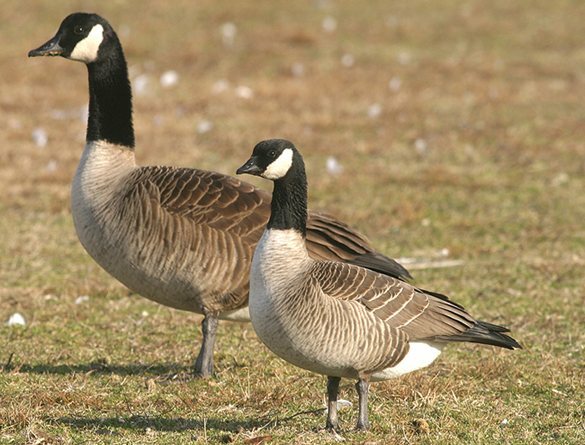 The small race parvipes of Branta canadensis was formerly called "Lesser Canada Goose". 6. neck ring: parvipes (but also taverneri) often shows a tendency to a white neck ring." Abb.8: Kanadagans B. canadensis, wahrscheinlich Unterart parvipes, Margrethekog, Dänemark, 29. April 2005 (© Kent Olsen). Ein anderer Vogel als der in Abb.7. Wiedergabe mit freundlicher Genehmigung von Kent Olsen aus Netfugl. 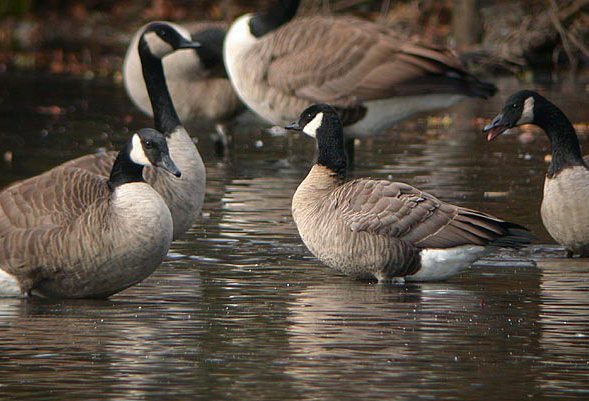 "This photo shows a Canada Goose, possibly a "Lesser" Canada Goose Branta canadensis parvipes which is a small race of Greater Canada Goose. 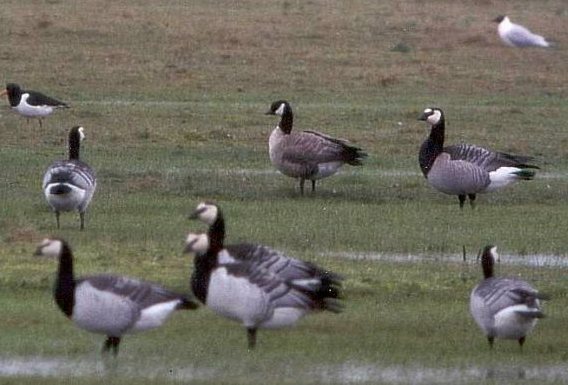 The bird was seen in southern Denmark on the border to Germany together with several thousands Barnacle Geese during the spring migration of 2005. Arguments for this bird being parvipes rather than Cackling Goose Branta hutchinsii are the length of the bill along the bottom of the lower mandible (70% of the head length), the partly inclined culmen (not straight, but partly concave) making the profile graduate into a rounded and similarly sloped forehead, the head is more or less continuous rounded without any sharp angles, particular between the forehead and the crown and also between rear crown and the upper neck (nape), the rather short and medium-sized body with a relatively short and thin neck along with a medium pale breast (not pure white) and a blended increase in darker tone downwards to the belly, the upperparts are brownish with neat, orderly rows of pale feather edgings. I might add a caveat that from these photographs a large hutchinsii might not be 100% ruled out. But after thorough field observations for several days and the fact that this bird shows a structure (particularly the relatively long and thin neck compared to a classic hutchinsii and longish legs) that eliminates hutchinsii, I think this bird is therefore best identified as a Greater Canada Goose Branta canadensis of the race parvipes."